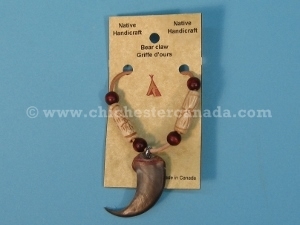 These REAL 1-Bear Claw necklaces hang on a 19" (48 cm) round natural leather strap with plain or carved wooden beads and a real black bear claw on a silver spring type of clasp. The beads cannot come off. 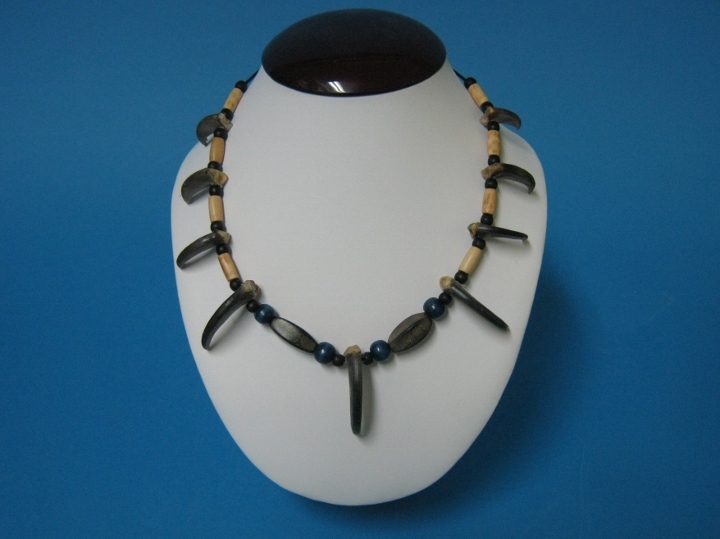 The hanging length of the necklaces are 10.5" to 11" (27 to 28 cm) and each weigh around 10 grams. 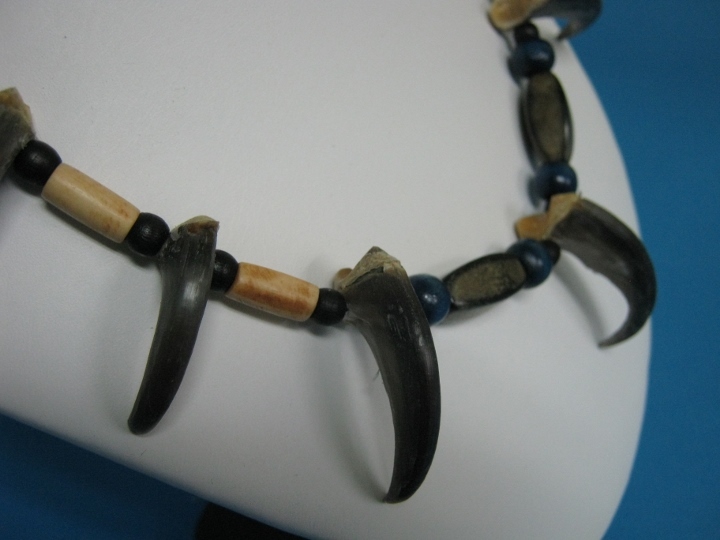 The length of the claws vary from necklace to necklace. They range between 4 to 6 cm long. 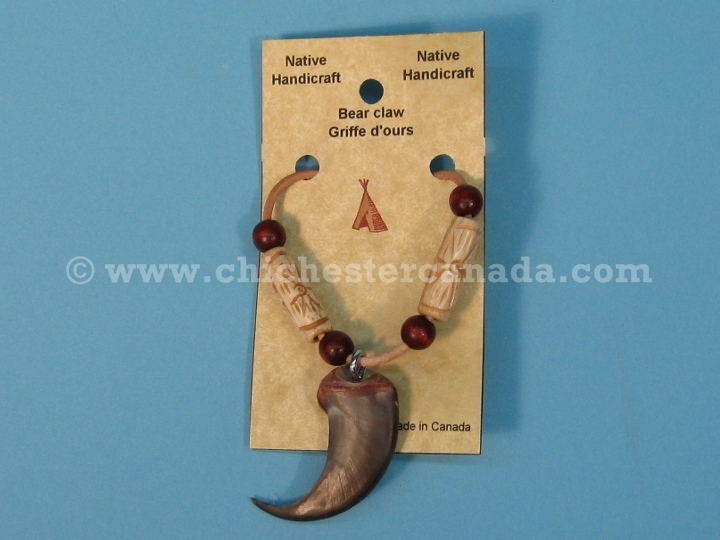 The 9-claw black bear necklace have blue and black round beads and plain long beads, while the 3-claw necklace has black long wooden beads (with or without carved designs) and round white or red beads. Both have hanging lengths of 22 cm, not including the claw at the midpoint. The 9-claw weighs 27 grams, while the 3-claw weighs 8 grams. 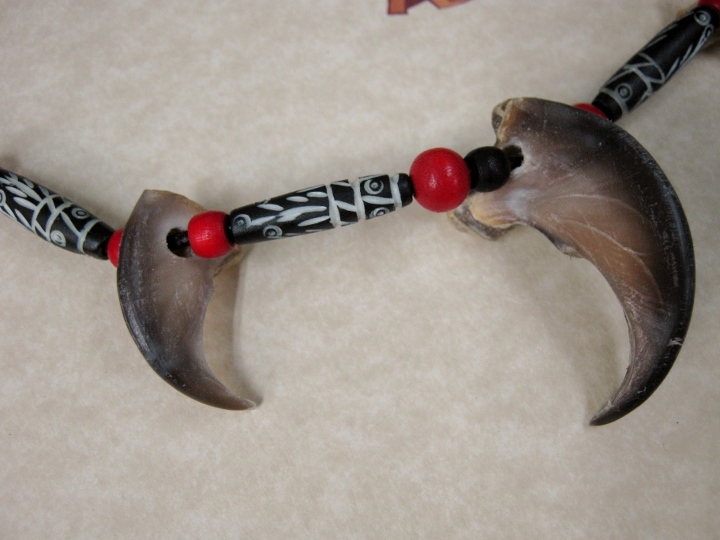 The claw & bone necklaces come in two styles. 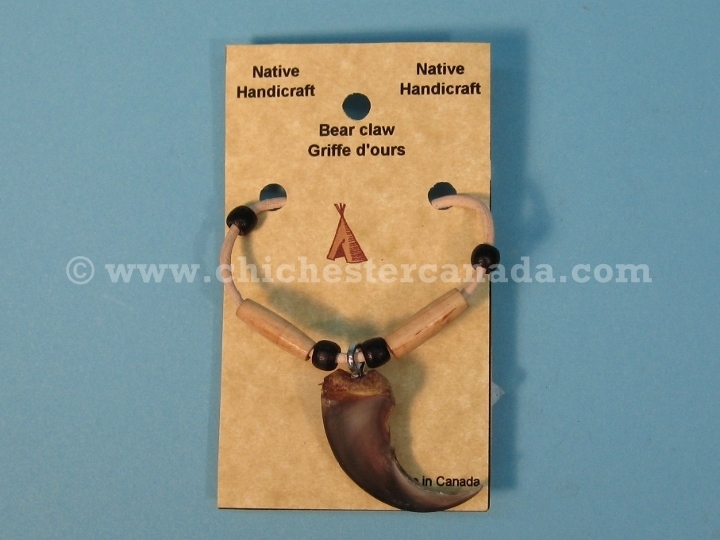 The beaded claw & bone necklace has red and black round beads, antiqued long beads, and two drilled bones measuring approximately 2 cm long. 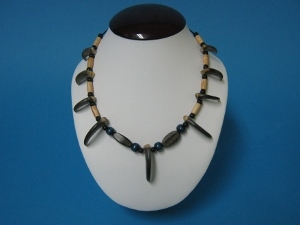 The necklace is 59 cm long, and weighs 26 grams. The claw pendants range from 5.5 to 7 cm long on the outside curve. 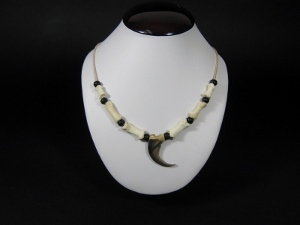 The simple claw & bone necklace hangs on a 55-cm black round cord, and has alternating black round beads and drilled bone, each measuring 1.5 to 3.5 cm long. 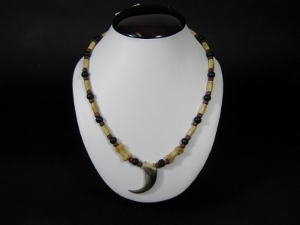 The claw pendant measures 6 to 7.5 cm long on the outside curve. The necklace weighs 24 grams. 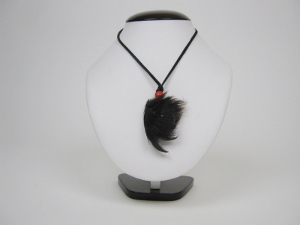 We have limited stock of hair-on black bear claw necklaces made from claws with a tuft of fur attached. The 5-6 cm claw pendants are hung from deerskin lacing that measures 30-35 cm long. Each weighs about 10 grams. Please note that the claws will vary in size. 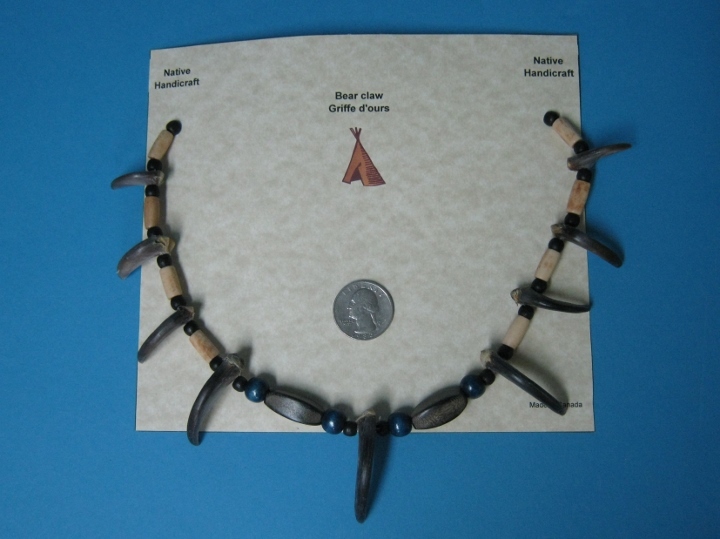 See below for pictures of the different kinds of black bear necklaces we carry..
Black bears are covered by CITES. Not for export in small quantities. Export may be possible for orders exceeding C$2,000.